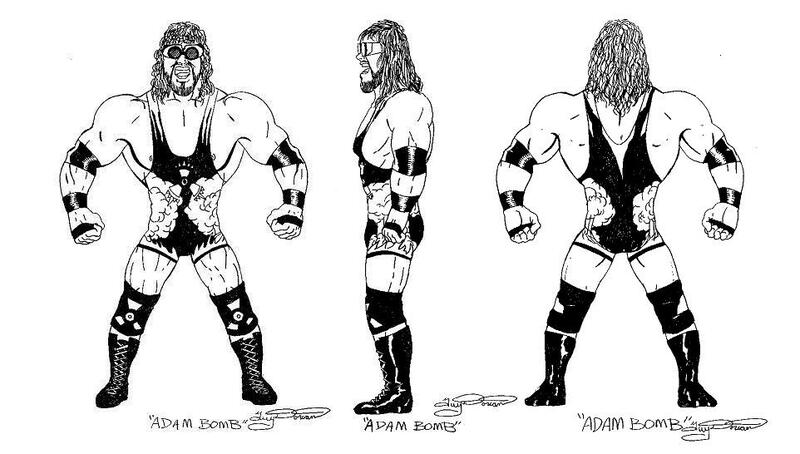 Thanks to my friend at Stomwijf.com, here's a look at some great conceptual drawings of the planned Adam Bomb and Dink the Clown Bendems straight from artist Guy Dorian, who worked on the Justoys WWF Bendems line. These drawings are doubly cool to me because I am a graphic artist who would love to have a job putting together artwork such as this. 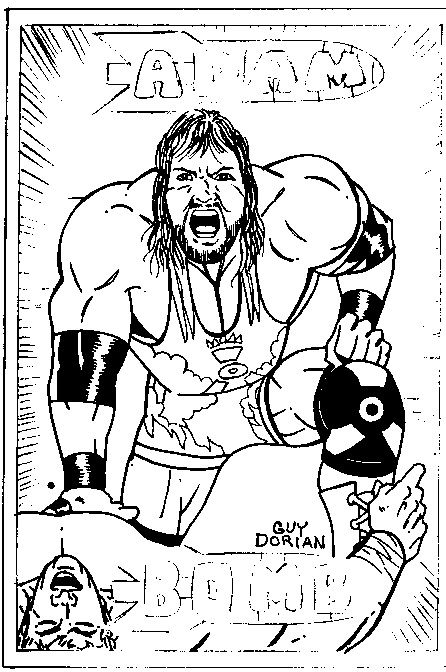 Mr. Dorian was also responsible for some of the illustrations featured on the tear-out collector cards that were a part of the Justoys Bendems packaging, as you can see in the 2nd sketch which was to be Adam Bomb's card. I envy you, Guy! Here is a look at the original planned lineup for Series II. As you can see, the line was supposed to include a 5th figure, Adam Bomb. Unfortunately, the series was shortened to 4 figures and he was scrapped. (i've heard because of disappointing sales of the first series. )There were also a couple more changes; Mabel was originally supposed to be blonde & wearing a different outfit, while the 123 Kid was originally wearing a blue outfit, similar to that of his Hasbro figure. I love this next item. This was the original prototype for the Bend-ems ring. This ring would have been SO much better than the one we got. I despise the stupid ring Justoys ended up releasing. It's so small there's no way a kid could play with it and have fun. And the storage comparment idea just made it look stupid in my opinion. Look at how much larger and better this ring would have been. 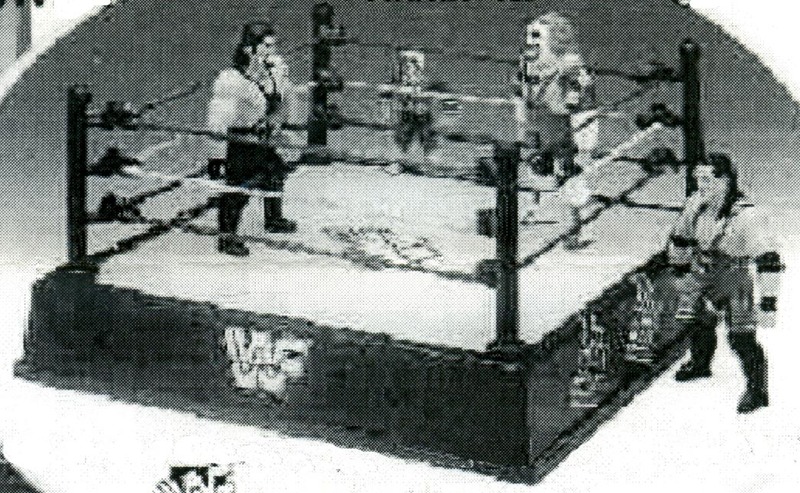 And look closely to the back of the picture, that little guy standing back there on the apron is none other than an unreleased Dink the Clown figure! For those of you who may not be familiar with him, Dink was Doink's midget sidekick. I still remember the day Santa Claus brought him to Doink as a Christmas present...man, wrestling was pretty stupid back then. I assume Dink was going to be an exclusive figure included with the ring, like Paul Bearer ended up being. It also looks like the mold used to make Dink may have been used again a few years down the road for the Micro-Bendems figures. They look about the same size. If anyone has a copy of these pictures in color and would be willing to share them, i'd GREATLY appreciate it. I'm pretty sure they came from an old Justoys Toy Fair Catalog, all I have are these black & white photocopies.